It must begin with Zechariah’s silence. Nothing against poor old Zechariah. Who can blame him for asking a decent question? The text tells us that both he and Elizabeth were upright and blameless before the Lord. So even if Gabriel comes off as a little testy and indignant, slapping Zechariah with silence for a tiny slip-up of doubt, maybe the silence isn’t about making Zechariah look stupid. Maybe it’s only about getting him out of the way. “I have been sent to speak,” says Gabriel. I’m the one speaking words here, words that come straight from God. Luke 1-56 is obsessed with words and talking, logoi and laleo. The Greek words for words are all over this passage in various forms. God speaks, the angel speaks, Mary and Elizabeth speak. The word for blessed, as in “blessed are you” and “blessed is the child,” iseulogemene—good-spoken-of. Meanwhile, Zechariah is silent. The passage in Greek is even more obsessed with words that come from the root gen-. To bring forth a child, to come to pass, to become, generation to generation. All these words in Greek come from the same root. In verses 1-56, gen-related words occur fourteen times. It’s almost a pun festival. God’s word is becoming, it is coming to pass. After a long wait—such long years of waiting—an urgent determination energizes the whole passage. This is the moment, and nothing will get in the way. So the word comes to Zechariah, and Zechariah is silenced, and then a child is generated within Elizabeth. The righteousness of this faithful couple does not cause this marvel, nor does old age and barrenness prevent it. And then the word comes to Mary, and a child is generated within her. Her humility and purity do not cause this miracle, nor does her virginity prevent it. Because, as Gabriel says, “nothing is impossible with God.” A more exact translation would be: “Not shall-be-unable before God every utterance.” The utterances of God must bring forth their purpose; there is simply no option. In the Old Testament idiom, God’s words do not “fall to the ground.” They sweep in, irresistible. Mary offers her willing response: “May it come to me according to your utterance.” And then she hurries to visit Elizabeth. Much speculation over the centuries about why she would do this. The people of Nazareth will be talking? Cousin Elizabeth could use some help around the house? The hills of Judah are nice this time of year? In the shape of the narrative, Mary goes to Elizabeth because this creates an exclusively female space. The two women—one old and disgraced, the other young and ignored—embrace one another. Now is their time to speak. Elizabeth exclaims “in a loud voice.” Blessed, blessed, blessed! The Holy Spirit fills her words, fills her womb, fills every empty space. Nothing against poor old Zechariah, but sometimes the ones who usually speak need to keep quiet. The ones who occupy the honored places in society, the priests and politicians, the capable and skilled, the smart and powerful—they all need to step aside. Maybe, too, that little skeptic in each one of us, blabbering on about what’s wrong with the world today and how everything is going downhill and, take it from me, I’ve been around long enough to be a little cynical and it sure seems as if the horrors increase every year. Even the faithful and true, after all, get tired of praying for the same things over and over. The years go by. Nothing seems to change. But then the word of the Lord comes to silence that part of us. The word of the Lord comes to silence the chatter of the powerful and still the strutting of the proud, to create a space for those who do not usually get to speak, a quiet moment where the disgraced embrace the ignored and something miraculous takes hold. Sometimes those who seem barren or very young or outside the circle or unimportant—sometimes those are the ones God has chosen for a hidden purpose. After all, when you’re the one always behind the scenes, you have time to listen and perceive what the powerful hide even from themselves. Sometimes you are the one who hears God best. In the same way, those places within each of us that feel disgraced and ignored, those are the places where God can plant a miracle. 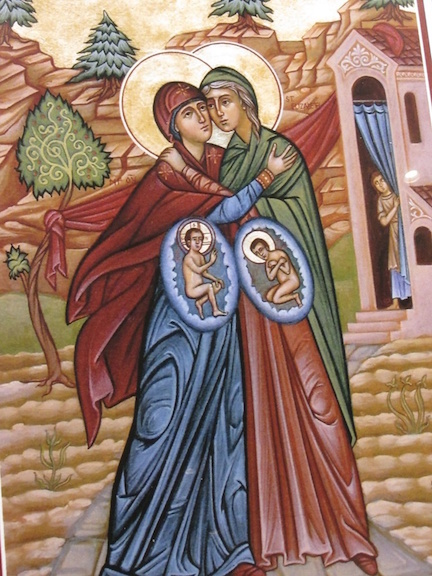 When Elizabeth hears Mary’s greeting, the baby leaps in herkoilia, her cavity. She says to Mary, blessed is the fruit of your cavity. If we can just get our worry and competence and bluster, however holy, to step aside and be quiet, we might find a lowly cavity hidden underneath and notice that it’s not as empty as we thought. Something very small and important is growing there. So old Elizabeth speaks “blessed” in a loud voice, and young Mary prophesies—feisty words proclaiming the mighty deeds of God across the generations. Everything is upside down: the proud rulers brought down, the humble exalted, the hungry filled, the rich left empty. Whatever our weariness and cynicism has gotten used to expecting, that’s what God is about to overturn. Nothing will get in the way of this, for the utterances of God never fail. It begins in emptiness and silence. It begins in the hidden places where the usually quiet get to pipe up their praise, in the cavities that open up to receive the word of God. That’s where the logos is generated. The Word comes to pass. The Holy Spirit sweeps in to fill every empty space. Christ is born.